It felt strange today to come home from work, and not have to paint all night. Like, I really didn't know what to do with myself! For the last few weeks, we've been hard at work finishing our hallway renovation, and we finished it just in time for our anniversary party on Saturday. 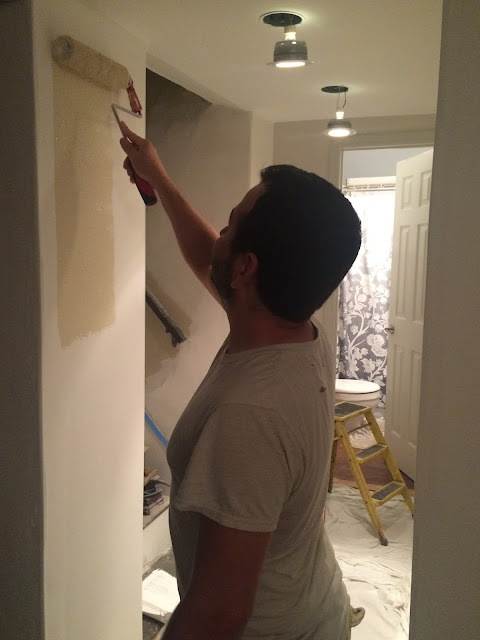 This has been the longest renovation project yet for us, in the nearly 6 years that we've been living in this house and fixing it up together! 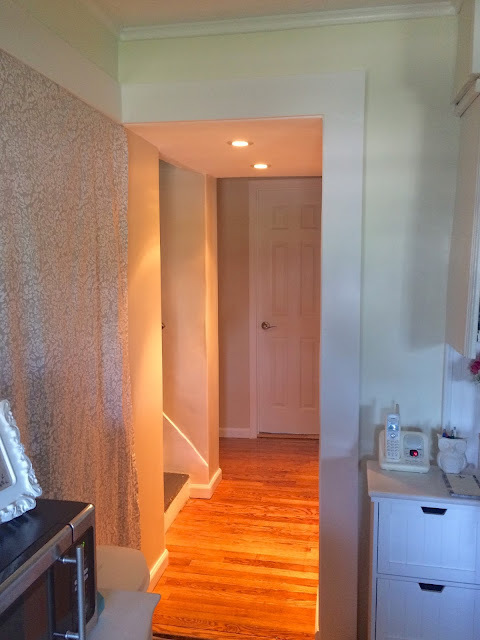 We first decided to rip out the hallway walls and ceiling back in 2011, then worked on putting drywall up, installed lighting, and put in 3 doors. But for a few years now, it was sitting unfinished while we went about our busy daily lives. It was hard to get the time and motivation to get it finished. But somehow toward the end of last month, we got the bug again and got back to work. We always say, if you want motivation to get renovation projects done around the house, throw a party. It's great motivation to get things finished so you can finally relax and don't have to stress about it when you have company over! Ha. 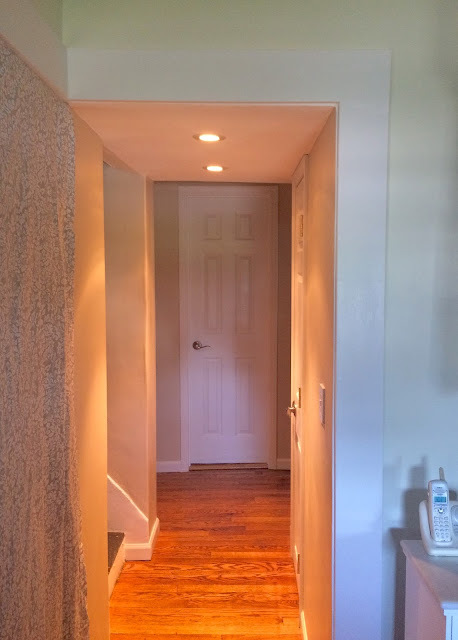 In the last month, we finished sanding the floor and refinished it, finished the mudding and sanding of the walls and ceilings, primed the walls and ceilings and painted them, finished installing trim and painted it, and painted all of the doors. 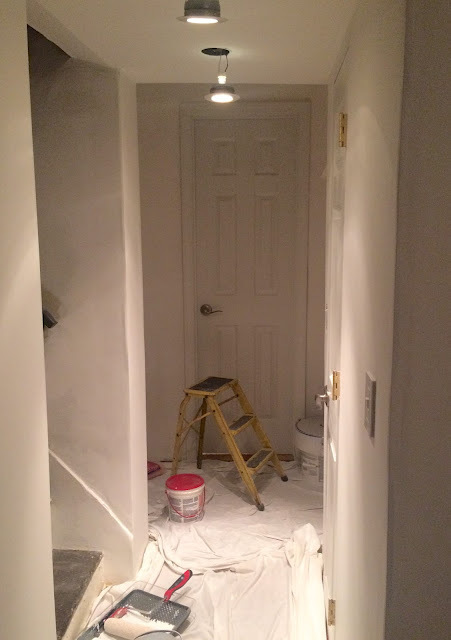 Once we started priming the walls, it was coming together and looking more finished, but when we got the paint on the walls, it really started getting real! 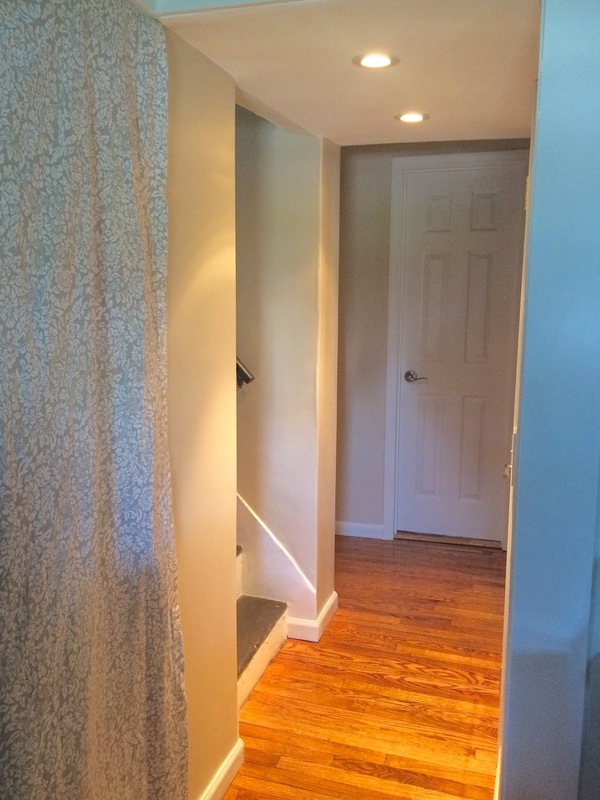 Paint always has that dramatic change effect - it can make such a difference. 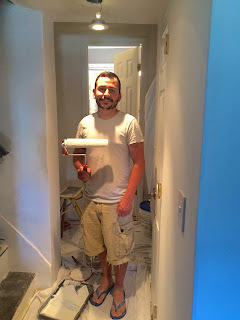 And we did a LOT of painting with this project. It feels like we painted everything! I was definitely getting used to coming home from work, eating, then grabbing a brush and a paint can. And I don't miss those nights. :) It's nice to finally be able to relax and enjoy it now. It was a nice anniversary gift for us, just to finally finish this space and be done with renovations for a while! We both feel like we put a lot of work into it. Of course it isn't perfect - there are a lot of imperfections, which you'll have with old houses, things not being level, etc. But it feels like a finished space now. 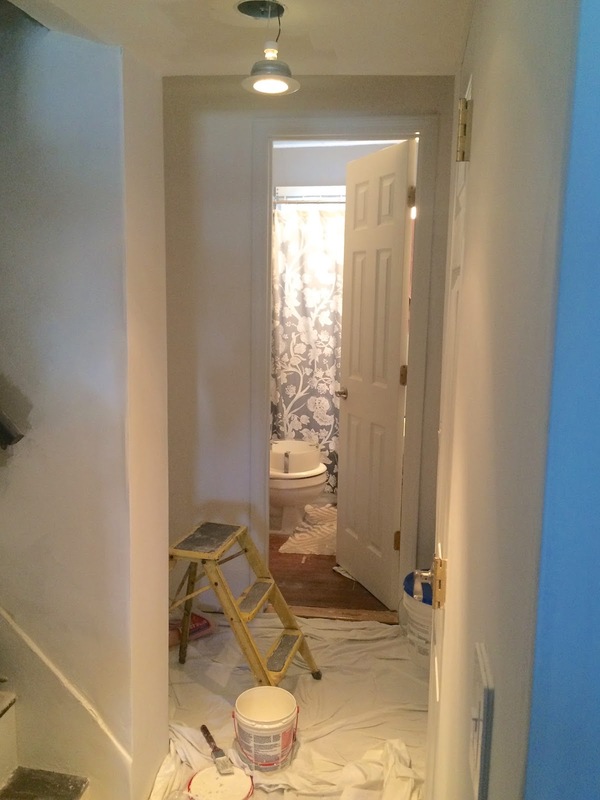 Now, instead of stressing about trying to get it done, or being embarrassed by the exposed drywall that was our hallway, we can sit back and check another thing off our home renovation to-do list. And it feels really good! 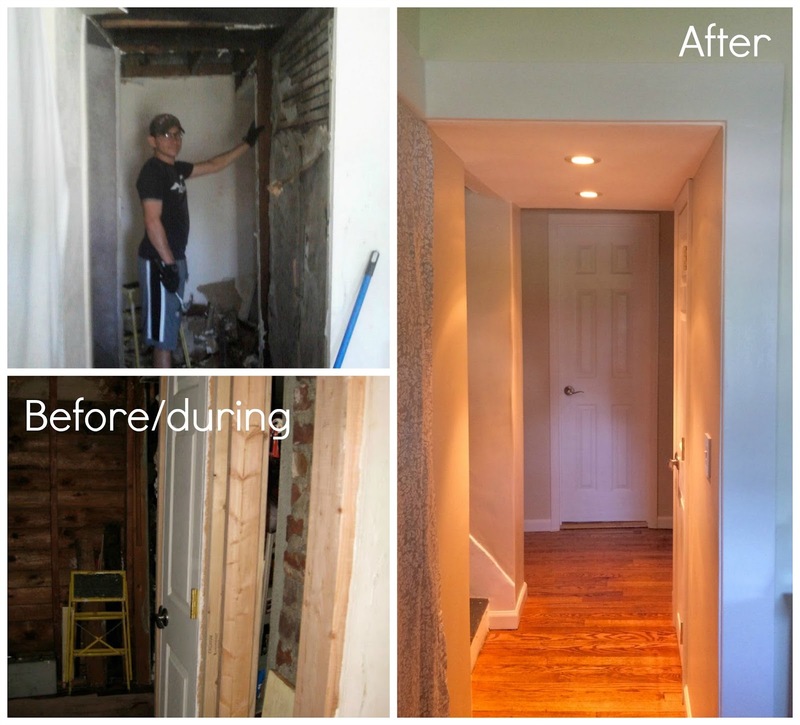 The "Before" pictures are actually kind of mid-renovation - the top left shows Trent demoing the old walls, and the bottom left shows the bare studwalls and new hall closet that we built. Hard to believe we are finally finished, even if it is 5 years later!